Free program, which allows you to change/replace multiple letters and phrases at a time. It is easy to create and save lists of changes/replacements, so that you can reuse them. Applications: character conversion, ROT13, ROT47, Morse code conversion. This little search and replace utility is great if you need to make changes to a range of text, HTML, XML or other text-based files. It will search one or more folders and show you the existing text in context, ready to accept or skip changes. Search and replace text and raw bytes in multiple files. Features include: multi-line text entry; full support for RegEx with syntax highlighting and match substitutions; built-in hex editor to replace bytes; wildcards and case-sensitivity; Unicode. Multiple File Search & Replace has a comfortable and convenient interface, geared specifically toward webmasters, web developers and search engine optimizers (SEO). The program can also be extremely useful in preparation and conversion of HTML files. PowerPoint Find and Replace Professional is a tool which helps to find and replace multiple words in Microsoft PowerPoint. The tool also enables to format different words and texts in a PowerPoint slides which is very easy and convenient to use. Excel Find and Replace Professional is a tool which helps to find and replace multiple words in Microsoft Excel. The tool also enables to format different words and texts in an excel workbook which is very easy and convenient to use. Quickly replace text in batches of AutoCAD documents. The application features several modes to select files: drag and drop, specifying Excel lists, or specifying folders. Update a range of files, search and replace text in all files in a folder. Supports wildcards to include or exclude certain file types. Preview window for single replacement, or Replace All. A freeware macro. 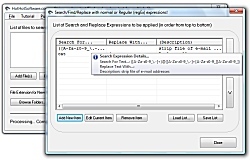 Word Search and Replace uses the find and replace functions built-in to Microsoft Word. Word Search and Replace can process multiple files in subdirs or not, do case sensitive, whole word, and pattern matching. Simple and very easy to use. Select file then enter "find what" and "replace with" field and finally the destination folder. Click Start button - voila, specified text is immediately replaced with a new text string! LBE Find & Replace lets you search and replace in Outlook Contacts, Emails, Appointments, Notes and Tasks, saving you hours of tedious work. Find & replace multiple phrases and words in multiple word documents through this professional software. It also allows various sorts of formatting like adding Super & Subscript,changing back and forecolor,adjusting upper and lowercase,bold,italic. Find and Replace Tool For Excel allows you to quickly and easily search and replace across thousands of Excel spreadsheets.Find and Replace Tool For Excel allows all user settings to be saved and opened so that the same tasks can be repeated again. This utility allows you to make a multi-replacement operation in MS Word files. Strings for search and replace can be specified in an Excel document. MAPILab Find and Replace for Excel is an advanced version of the "Find and Replace" function. The add-on has a number of benefits: simultaneous work with several files; saving and downloading retrieval requests as templates for reuse and other. PDF Text Replace Tool allows to change or delete text in PDF files. Select thousand files and modify them with one click. No Adobe Illustrator or Reader needed. With the help of this program, you can quickly find and replace text, correct html code and hyperlinks in multiple file, add new links or re-format the design of the entire site. Software extremely useful in editing of multiple html and text files. This software offers a solution to users who want to manipulate text files. Add files by drag-and-drop, create a find/replace list, and click to modify all selected files. Find/replace lists may be saved to disk and imported for later use.